The yellow hues mixed amongst the clouds at sunset highlight the buildings near the banks of the Assiniboine River in the City of Winnipeg, Manitoba. A house boat sits at the marina at The Forks along the Assiniboine River while the luxurious Hotel Fort Garry and the Royal Crown Resolving Restaurant stand in the backdrop. The Assiniboine River runs for 655 miles through Saskatchewan and Manitoba and where the two rivers meet, the Assiniboine and the Red, the Canadian National Railway crosses over. 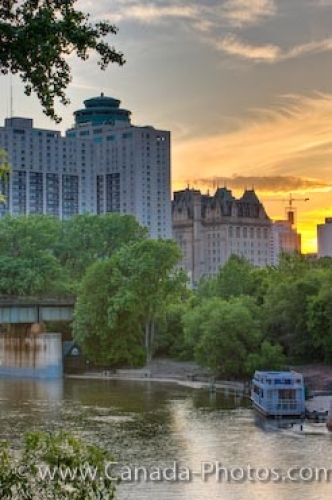 Sunset over the Assiniboine River, The Royal Crown Revolving Restaurant, Hotel Fort Garry, and the marina at The Forks, a National Historic Site in the City of Winnipeg, Manitoba, Canada. Picture of the Assiniboine River and the buildings in Winnipeg, Manitoba at sunset.